Umm. A battery made from bacteria poop? 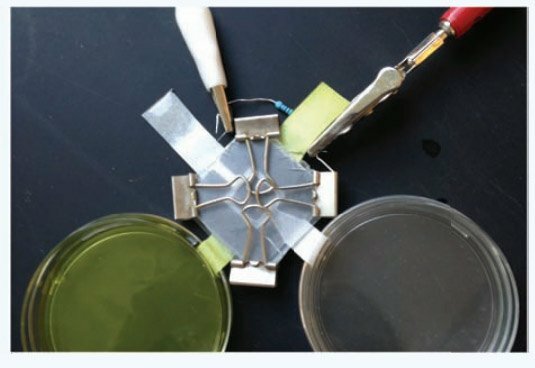 For the first time, scientists were able to create a 3D microbial fuel cell capable of producing electric current without an outside source. The cell is made out of paper and is still at a proof-of-concept stage. This development suggests that it is possible for future batteries to be powered by microorganisms instead of earth metals, such as lithium. The fuel cell uses the electrons produced after the bacteria, Shewanella Oneidensis MR-1, consume potassium ferricyanide. This combination of the bacteria and food serve as the battery’s electrolyte. In order to make both flow towards each other, the researchers created tiny capillary-like channels in the paper. As the two met, the bacteria digested the food and, as it continued to produce electrons, the battery also continued to pump out electricity. The set-up is able to produce 25 watts per cubic meter of food and bacteria. Admittedly, this is not a great deal of power. However, great promise of development is shown.